What Base Ten Blocks should I get? The Deluxe Combo Kit Combo comes with not one, but TWO sets of multi-tens. By now you see that base ten blocks are far too powerful to just let them be relegated to teaching place value and maybe some addition and subtraction...but with all the stuff available, figuring out what to actually buy can be confusing and with all the material on this website not to mention my blog making a purchase can be daunting. People ask me what to get...I say. "get a combo kit, a set of multi-tens and the passwords. Do they listen? Nope. Have to get books, have to get a DCSK (a fine idea if you have $$$ and a gaggle of kids under 12, overkill if you just have one, and inappropriate if that kid is over 14...when in doubt: combo kit, a set of multi-tens and a password (or passwords). Can you see why the last seminar company I worked for fired me? LOL. Maximize sales? NO. Appropriate sales YES. For most of you, your base ten block needs will be met with a combo kit, multi-tens and a couple of passwords is appropriate and entirely adequate. The DCSK is by far the best deal if you have the cash and the kids...but you can more than just get by with a combo kit, multi-tens and a couple passwords. You buy the tools (the base en blocks) my blog and my website and to a lesser extent my self will teach you how to use those tools. Promise. Here is the parent teacher training page. This page along with the other password protected pages will make math EZ for you and yours. TWO passwords the Sitewide & P/T training are basically all you need to get started. One for the training page and one that gets you in almost everywhere else. Once you get the blocks make sure you get some TRAINING too. It's great to have the best tools but the best tools will produce shoddy work if you don't know how to use them. Recently I have been VERY pleased with a couple of sets of parents who were very hesitant and very "afraid" of teaching their kids math, but they "dove in" and things are going GREAT. Have a little faith...and just do it...over the last quarter century I have shown many hesitant parents (and teachers) how easy math can be if you have the right tools and the right mindset. Learning math (or whatever it is) with anybody but especially your kids is a beautiful thing. If you are just getting started check out this page. Passwords will be delivered to you via email within 24hours, usually much less. Blocks should be there within 2 weeks (Could be faster but I don't want you to get your hopes up.) MAKE SURE TO INCLUDE YOUR PHONE NUMBER OR YOU WILL SLOW THE WHOLE PROCESS. If your blocks haven' arrived within 4 weeks email me. There are two multi-tens shown here. A Combo Kit comes with no multi-tens,a Combo Kit Combo (CKC) comes with ONE, and the Deluxe Combo Kit combo comes with two multi-tens. (DCKC). 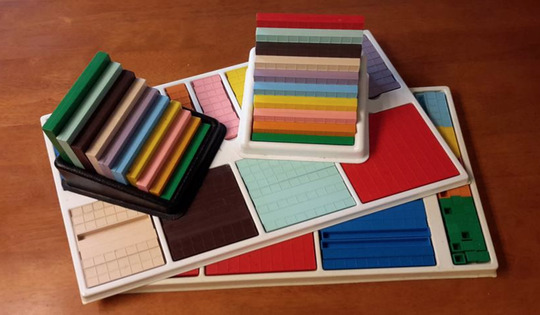 These blocks are really useful for making math (and math presentations) EZ fun and FAST. Most of all fast. No more fumbling around counting out tens or X's...the mind wants to work quickly and these blocks allow you to do so. When you order you get ONE set of multi-tens. 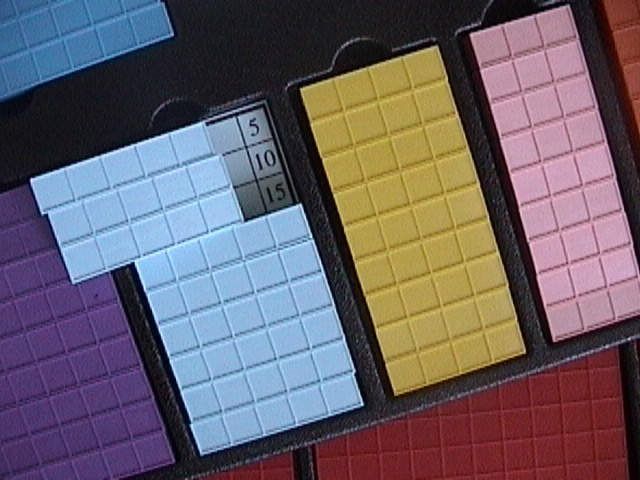 Pictured above are TWO sets of multi-tens blocks. If you want to order an extra set of them you can...but one is all you need. No, you don't get to specify the color of the tray they come in. I'm trying to make this as easy and affordable as possible. 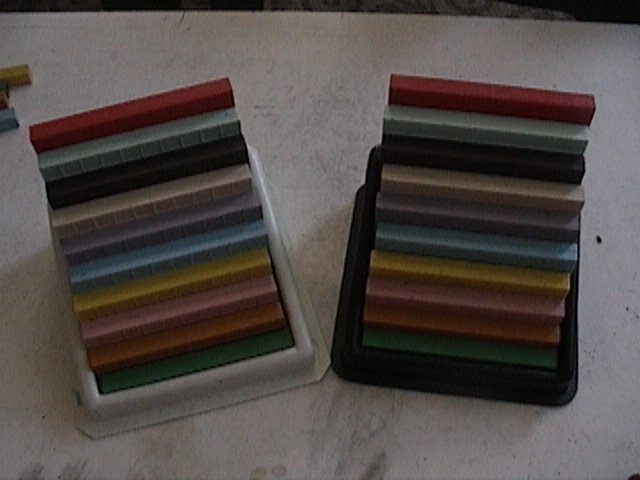 I also recommend ebay and craiglist when looking for blocks, and if you have MUS blocks or cuisenaire or other base ten blocks they will work, but I think you will soon find these are the easiest to use and the most versatile. The information contained on my training page and password protected pages can be found no where else. In fact most of the information on this website can be found nowhere else. If you are on a tight budget this is the way to go. If you have extra funds ordering books and manuals would the next logical step but you don't need them to get the most out of your blocks. Further this website and my blog obviate the need to buy all the books and manuals. Soon you will be able to get the PDFs page by itself...but it is included with your "Sitewide" Password. Go to Products and Passwords. Allow 6 -8 weeks for delivery of physical products, up to 24 hours for passwords. Prices include shipping to the continental contiguous 48 states only. Shame on you Aussies and Canadians for trying to get it shipped to your door at these prices. Email for additional shipping to your country or Alaska and Hawaii...MAKE SURE TO INCLUDE YOUR PHONE NUMBER WITH YOUR ORDER, they usually use FedX and FedX requires a Ph# for delivery. 1. Free shipping to Continental USA Destinations (Not Alaska, Hawaii, or outlying USA Territories). 2. International Shipping is billed by Mortensen Math World Headquarters prior to shipment. 3. No Cash Refunds. Credit exchange only with RMA. Email first for RMA: MortensenMath at iCloud.com. 4. When your order is received by Mortensen Math World Headquarters you will receive a CONFIRMATION email. 5. Please allow 6-8 weeks for receipt of your order. If you have not received it or heard from us within 3 weeks please request ORDER STATUS at: MortensenMath at iCloud.com. 5. When your order is shipped by Mortensen Math World Headquarters you will receive a TRACKING email that includes an ETA. "A mathematician is a blind man in a dark room looking for a black cat which isn't there." ~Charles Darwin. "If there is a 50-50 chance that something can go wrong, then 9 times out of ten it will." ~Paul Harvey.